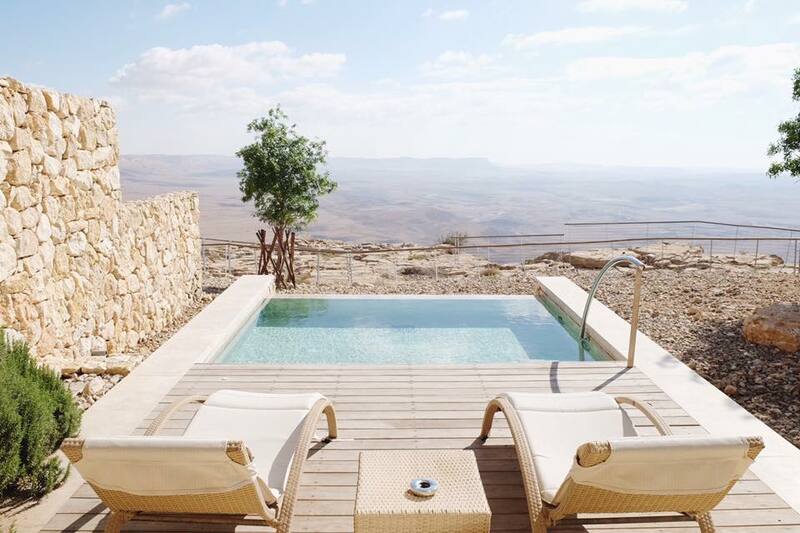 Two days is the perfect amount of time to stay in Mitzpe Ramon. While exceptionally beautiful, there is not too much to do after exploring the crater and the few tourist attractions. Even if you are traveling to Mitzpe Ramon in the summer, remember to bring some layers to wear when exploring. It can get windy in the crater, especially when driving an ATV or Jeep, so it is better to come prepared! Not all rooms overlook the crater, it’s well worth it to book in advance and reserve a room with a view. One of our friends, a prolific traveler, claimed it was the best hotel room view she ever had in all her travels! Stay: Beresheet Hotel is situated at the edge of the Ramon Crater, a unique natural phenomenon with dramatic views, guaranteed to take your breath away. While not the only hotel in the town of Mitzpe Ramon, Beresheet is undoubtedly the nicest and most luxurious option. With multiple restaurants and a beautiful spa, this hotel is an intrinsic part of what makes a trip to Mitzpe Ramon so special. Other options nearby include the Ramon Suites Hotel and the Isrotel Ramon Inn. Eat: The restaurants at the Beresheet Hotel serve gourmet, delicious Mediterranean fare showcasing many ingredients sourced from nearby farms. My family ate all of our meals at the hotel, and we were never disappointed. For our main meals of the day, we ate at the fancier of the two restaurants, Rosemary. After a busy day of activities, and in need of a small treat, we would head to the Lobby Bar for a more casual bite. If you are looking for a change of scenery, some local restaurants with good reviews include Hahavit and Tzokim. Explore: There is no shortage of things to do--each activity more fun than the next! My family and I went ATVing on our first day, driving through all different parts of the crater while also learning about it’s fascinating history. Our second day we rented mountain bikes and rode along the edge of the crater, soaking in the views as well as the dozens of unique sculptures that stretch for miles. Looking for different ways to explore the crater? Make a reservation for a jeep safari, hot air balloon ride, camel trek, horseback riding trip, or opt to go on a self-guided hike! Activity: To learn even more about the history of the crater, head to the recently built Mitzpe Ramon Visitor’s Center. The center is also home to interesting exhibits about Israel’s history. The Northern half of town, called the Mitzpe Ramon Spice Quarter, is also a popular tourist attraction. Still, the crater is probably where you want to spend most of your time, as it is truly fascinating. Relax: While there is a lot to do, many people, especially locals from nearby Tel Aviv (a 2 1/2 hour drive) come to enjoy the spa and savor the desert landscape from the beautiful infinity pool.